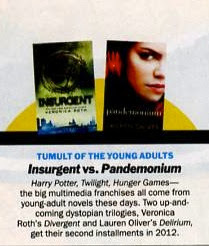 Two of the big Dystopian novels have sequels coming out this year: Divergent with it's sequel Insurgent; Delirium, and its sequel, Pandemonium. They must be more popular than any of us thought, as Time Magazine has picked them up as part of their essential guide to 2012 - Fight Club (the people, activities and objects, with the occasional animal that will battle it out for the top spot in 2012). Looking forward to the sequels, what do you think? Who will be the top of the Dystopian Charts? So excited about both of them!! Divergent was hands down my favourite book of 2011, though many others were very close (The Hunger Games was my second-last read of 2011 so I'm not sure ~ they may be tied for first place). Delirium was right up there, though I read it in 2010 I believe, thanks to Netgalley. Very very beautiful book. I am looking forward to both books. I loved their predecessors!